Sit in the sled/leg press machine with your back pressed against the back support. Place your feet flat in the center of the platform. Hold the handles for stability. Push the platform up until your knees are almost fully extended. Position the balls of your feet on the bottom edge of the platform so that the arches and heels of your feet extend off. Exhale as you extend your ankles to push the platform up. Hold for a count of two and squeeze your calves. Inhale as you flex your ankles to lower the platform until you feel a mild stretch in your calves. Hold for a second to allow the stored elastic energy in your calves to dissipate. Keep both phases of the repetition slow. Ensure you complete a full range of motion. Try not to lock out your knees. Keep your back pressed against the back rest. This includes your lower back. If you have a difference in muscle size or strength between your two calves, do one calf at a time, starting with your weak calf and making sure to not perform more repetitions with your strong calf. Notice that you don’t have to release the safety lever that allows the platform to slide all the way down to the bottom of the sled. The reason is that all of the movement takes place above the safety lock. The sled calf press is also known as the leg press calf press or incorrectly as the sled calf raise. 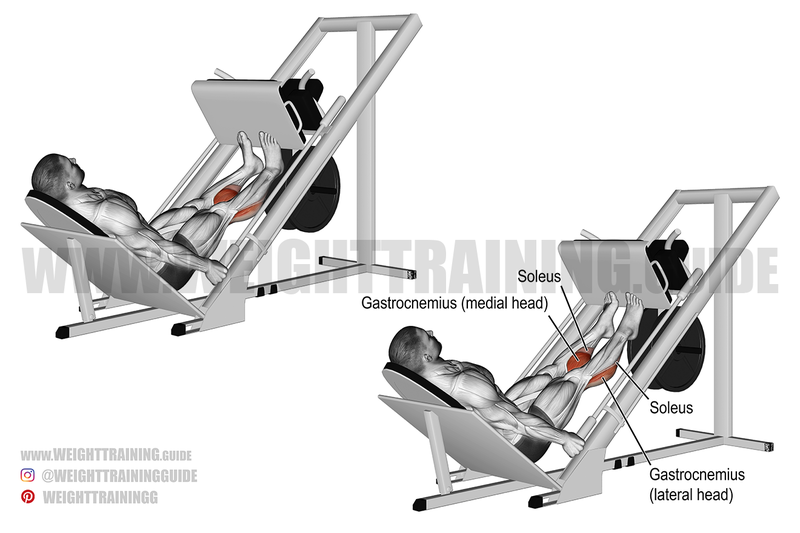 Remember that calf exercises in which your knees are extended (such as the sled calf press and the machine standing calf raise) target your gastrocnemius while your soleus acts as a synergist, and calf exercises in which your knees are flexed (such as the machine seated calf raise) target your soleus while your gastrocnemius acts as a synergist. Interesting. Never thought of this exercidse. Good post! Never realized sled can be used for this. Like to superset this with leg press. Legs burn! !